Hi all! Today's TT theme is our best bargain polish. This was a really hard one for me, but in my head this wasn't the cheapest polish I've ever gotten. This polish was on sale when I got it, and it's also one of my favorite polishes, so that's what makes it a bargain in my mind haha. 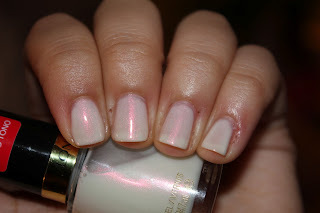 Revlon Runway Pearl is 1. a repeat polish [sorry!] and 2. an amazing off white. I'm in loove with the shimmer! Check out the other Twinsie's bargain polishes! ooh wow..super mad at myself for passing up that revlon!! gorgeous. hope i can still find it about! The two are so gorgeous together! I really love the pink tones. The shimmer in this polish is gorgeous!! The shimmer of this is beautiful. I love white shimmer - it's really one of my favorite polish colors! Guest Post from Amanda of Amandalandish!